Continuing conflict in Venezuela between the government of President Nicolas Maduro and opposition political parties will not be resolved by external forces taking sides. In this regard, Caribbean Community (CARICOM) heads of government were right at their August 8 meeting to reject suggestions that they should adopt pre-conditions for the facilitating role they want to play between the protagonists in Venezuela. The role of a genuine facilitator is to enable groups of people to achieve their own purpose in their own way. It is not to set the parameters of a dialogue or to take sides or to appear to do so. Any hint of a pre-determined approach to facilitation of a meaningful dialogue would kill it before it starts. When parties to a conflict are emboldened by external elements, they continue antagonist behaviour in the belief that the force of external pressure will ultimately cause their rivals to succumb. They have no incentive to engage in a dialogue that requires compromise by all sides to be successful. Those countries or groups of countries that have boldly issued statements of condemnation of the Venezuelan government, as has been done by some member states of the Organisation of American States (OAS), acting on their own, have not helped to create a climate for genuine dialogue between the rival groups in Venezuela. Neither have the members of the Bolivarian Alliance for the Peoples of Our America (ALBA), which have consistently defended every action by the Venezuelan government. The role of governments and hemispheric institutions, recognising that the situation in Venezuela is a contest for power between political parties should have been constructive in promoting dialogue within a democratic framework long before the economic circumstances of the country declined as a consequence of the dramatic fall in the price of oil. The economic deterioration is the main contributor to the shortage of food and medicines that plague the country. But altruism and ethics do not drive the foreign policy of governments. Other considerations, such as ideology, economic self-interest, and, in some instances, control, are the real motors of external policies and actions of governments. All of these elements have been at play with regard to Venezuela. As part of their arsenal, powerful governments on both sides of the divide in Venezuela have not been above pressuring others to line-up with them. CARICOM governments have not escaped that pressure. Fortunately, and admittedly, not without robust debate, CARICOM governments have managed to maintain a commitment to their declared collective desire to play a facilitating role between the parties in Venezuela. However, the stated neutrality of the group is undermined by the participation of some of its member governments in the public declarations of ALBA on the one hand, and a disparate group of countries within the OAS on the other. If CARICOM, as a collective, is to play a neutral and facilitating role in Venezuela, its individual member states have to adhere to that position and refuse to be drawn into the positions of other groups of countries. There is, of course, no guarantee that CARICOM’s offer of facilitation will be accepted by all the Venezuelan parties. The offer is to facilitate “a renewed dialogue and negotiation leading to a comprehensive political agreement with established timetables, concrete actions and guarantees to ensure its implementation for the well-being of the nation”. So far, there have been two positive responses – one from the government and another from one of the opposition parties - to the offer made on behalf of CARICOM by its current chairperson, Dr Keith Mitchell, the prime minister of Grenada. A third response, while not rejecting the offer, appears to require further clarification. Until the response to the CARICOM offer is clear, and assuming that it is accepted, no CARICOM country should agree to join declarations of other groups of countries that would serve to impair the neutrality and facilitating role of CARICOM as a whole, however great the pressure. In this context, it was prudent of four CARICOM governments – Grenada, Guyana, Jamaica and Saint Lucia – not to associate themselves with a declaration issued in Lima on August 8, by 12 member-states of the OAS that gathered (with the CARICOM four) of their own volition in Peru. Amongst many statements couched in strangely non-diplomatic language, the foreign ministers of 11 Latin American states and Canada called for, among other things, the postponement of a meeting scheduled for October between the European Union (EU) and the 33-member Community of Latin American and Caribbean states (CELAC). What the 11 Latin American states and Canada (which is not a member of CELAC) believe gives them the right to call for the postponement of a meeting that affects 22 other Latin American and Caribbean countries is baffling. 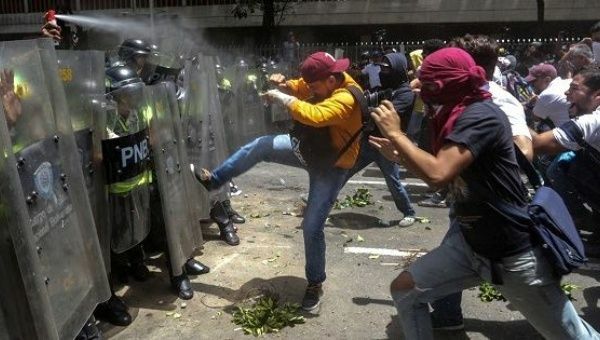 But, it is a measure of how unbalanced and unhelpful the attitude to events in Venezuela has become amid the scenes of violence, arrests of political figures, food shortages and excessive behaviour by both demonstrators and police. Wisely and probably tactically, the US government did not attend the Lima meeting and was not party to the August 8 Declaration, although it has applied sanctions against leading personalities in Venezuela, including Maduro, over the election of a Constituent Assembly to rewrite the country’s constitution. However, the US did not apply sanctions to the Venezuelan oil industry ostensibly because of harm that banning Venezuelan oil imports would do to 525,000 refining-related jobs and nine refineries in the US. Six Republican congressmen from Texas, Mississippi and Louisiana wrote a July 28 letter to President Donald Trump expressing fear that “potential sanctions will harm the US economy, impair the global competitiveness of our energy business and raise costs to consumers". For its part, the CARICOM region has an abiding interest in Venezuela avoiding a massive outflow flow of refugees; curbing violence that could do irreparable damage to the economy and to the capacity of the society to restore its cohesion; and rebuilding a vibrant economy that once played a part in Caribbean economic development and social welfare, and could do so again. And, in regard to the Venezuelan contention with Guyana over the 1899 arbitral award that settled their border dispute, Venezuela needs a stable government that can follow a path, in keeping with international law and practice, to end the issue. Even while recognising that it might fail in its efforts to facilitate a genuine dialogue between the Venezuelan parties to decide the future of their country, CARICOM must continue to avoid being drawn into the purposes of others.